Dividends by Another Name - Epoch Investment Partners, Inc.
companies are notoriously bad at timing share repurchases, buying when flush with cash and share prices are high. Epoch’s view is that a share repurchase program can be, and more often than not is, an important component of a company’s shareholder-value-maximizing capital allocation process. Our approach is based on identifying companies that are good “capital allocators,” such as those firms that have a track record demonstrating an ability to deploy cash toward investment opportunities that enhance the value of the firm, as well as returning value to the owners of the firm when capital reinvestment opportunities in the form of internal projects or acquisitions are not available. We see share repurchases simply as one of the ways that a firm can return excess cash flow to shareholders. From this perspective, a firm that has free cash flow left over after funding all internal and external projects that meet return on invested capital (ROIC) hurdles has a fiduciary obligation to return that excess free cash flow to the owners of the business. The guiding principle is that management and the board are stewards of the capital that is ultimately owned by the shareholders. To retain the cash and invest it in low-return projects is a misallocation of the owners’ capital as well as a mis-use of society’s scarce resources. But given back to the owners, the capital can then flow to investment opportunities that generate high ROIC — to the benefit of the owners of the capital and to society at large. By the same logic, if a company foregoes attractive ROIC opportunities and instead returns cash to shareholders, that is also detrimental to the owners of the capital and a misallocation of society’s scarce resources. Whether that shareholder distribution takes the form of a cash dividend or a share repurchase program does not matter. Admittedly, the value to shareholders of a cash dividend is obvious and tangible, while the value of a share repurchase is not quite as straightforward. But consider the following simple example: If you were one of ten partners who owned a business, and it was (mutually) decided to use free cash flow to buy out the interests of two partners, the remaining eight partners would end up each owning 1/8 of the business instead of 1/10. Note, there has been no diminution of the business enterprise value because you did not sell off an asset to raise the cash to fund the repurchase of interests, you used free cash flow and nothing has happened to impair that collection of assets from generating future cash flows. To be sure, there are companies that add leverage, and thereby risk, to finance share buyback programs, and (shocking though this may be! ), there are management teams who are more interested in lining their own pockets than creating value for the owners of the business. At Epoch, we strive to weed out the “bad” share buybacks from the “good” through careful and thorough analysis of the businesses in which we invest. A critical part of our investment approach is to visit with senior management teams not once, but on a recurring basis. Through this interaction, we gain a sense of the capital allocation philosophy of the people who run the firm. Of course we cannot read the minds of management teams nor see into their souls, but we certainly can examine the history of the firm under their control to assess whether they have successfully identified high-return investment opportunities that enhance the value of the firm, whether the cash flow that has been returned to owners is, in fact, the highest and best use of that cash, and whether their focus has been on short-term, self-enriching manipulation of EPS. Perhaps the 2014 share repurchase program of Herbalife, financed with debt and accompanied by the termination of the quarterly dividend, offers an example of a share repurchase program that fails to meet our definition of value-enhancing. And, what about the criticism that share repurchases are only a temporary phenomenon, that as soon as managements see compelling investment opportunities, they will quickly shut off the flow of capital to this use? We would readily concede that share repurchases can ebb and flow as the business environment evolves. This, in fact, is a key attraction of the share repurchase program for managements: they can “dial up or down” spending on share buybacks as investment opportunities present themselves, while maintaining a commitment to a stable and growing dividend. A case in point is Emerson Electric Co. Emerson has paid a stable and growing dividend for many years, and has also regularly repurchased shares — all funded with free cash flow and all the while generating a ROIC in the mid- to high-teens. Furthermore, the company has a clearly stated capital allocation policy, and it communicates its plans in a timely and transparent way. In early 2014, management presented guidance that described the company’s intention to scale back share repurchases this year in favor of pursuing several compelling high-return capital projects. In terms of our “five uses of cash” framework, this is exactly what we would hope to see from a good capital allocator. Lastly, what about the “poor timing” argument, that says companies seem to buy shares when the shares are expensive rather than when they are cheap? To this we can only say that if it were easy and straightforward to determine when shares are “expensive” and when they are “cheap,” we would all have made fortunes a long time ago! “Expensive” and “cheap” are slippery terms, even for career investment professionals with decades of experience. Since a stock price today reflects the expected future cash flows from that ownership interest, discounted back to the present at an “appropriate” discount rate, the labels “expensive” or “cheap” implicitly include a multitude of assumptions about the uncertain future. Should we assume earnings and cash flow grow 3% per year? 5% per year? 7% per year? Perhaps 3% per year for the next two years and then 5% per year for the next 5 years? Should we discount these cash flows at 8% per year? 10%? 12%? As a result, at Epoch we would prefer to see companies with a share repurchase program that depends on today’s free cash flow evaluated against today’s set of investment opportunities for that cash rather than hope for management to make timely calls on the relative valuation of their shares. In our opinion, the related criticism that share repurchases frequently do not generate an attractive return on capital is based on a fundamental misconception. Studies have attempted to evaluate cash used to repurchase shares in the same way that cash is used to make a capital investment. While this seems to make some sense, it fails to distinguish between a return on capital and a return of capital. When a company uses cash to, say, build a new manufacturing facility, it is appropriate and desirable to evaluate the return that the company earns on this capital investment. But, when a company uses free cash flow to retire shares, it is not somehow buying its own shares and holding them as an investment, hopefully earning a profit on its position. It is returning capital to the owners of the business. Those retired shares no longer have any more value than an old invoice marked “paid.” A share of stock is evidence of an ownership interest; when the shares are repurchased and retired, the ownership interest is extinguished. It is both illogical and circular to suggest that a company can earn a profit from the appreciation of shares that it holds in treasury. It is equally illogical to assert that stock price appreciation subsequent to a share repurchase program is evidence that the shares were undervalued at the time of the buyback and therefore management has succeeded with a value-enhancing repurchase, or that the failure of shares to appreciate following a buyback is proof that the share buyback was a mistake and not value-creative. The path of the company’s share price over time reflects an enormous multitude of influences, both internal and external to the firm. The best way to think about share buybacks, in our view, is not that they will lead to subsequent share price appreciation, but that at the time of the repurchase, returning cash to the owners was simply the next best use of cash at that point in time. Bottom line: at Epoch, we look to invest in businesses that have proven themselves to be good capital allocators by investing free cash flow to fund high-return growth opportunities and by returning value to shareholders in the form of cash dividends —and share repurchases. 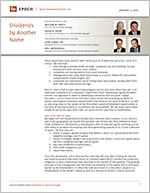 We see dividends and share repurchases as equivalent ways of returning excess free cash flow to the owners of a business, i.e., our clients. We acknowledge that not everyone may agree with this view of share repurchases and that some of the objectors come with academic credentials. But our approach reflects a sound logical and theoretical footing — Modigliani and Miller’s Nobel Prize-winning paper for a start. And our investment track record built over many years gives us confidence that our take on share buybacks has empirical support as well.